Welcome to our Innovation Lab! 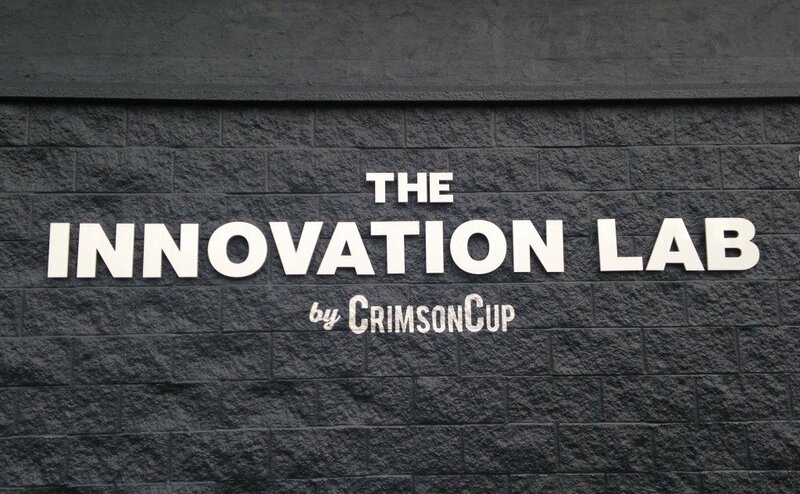 After months of planning and construction, the Crimson Cup Innovation Lab is ready for action. Hundreds of Crimson Cup customers, community supporters, members of the local business community and local media joined us for our Open House in Friday, January 15. And, we’ll be hosting another first look for customers on Saturday, January 30. Free transportation is available from the Crimson Cup Coffee House at 2468 Northwest Boulevard in Upper Arlington. Located at our former headquarters and roasting facility at 700 Alum Creek Drive, the Crimson Cup Innovation Lab is a space for both consumers and coffee professionals to learn about what goes into a great cup of coffee – from origins of the beans to roast level, grind, brewing techniques, drink preparation and more. The Innovation Lab features areas for coffee evaluation, roasting, training and gathering. Application Lab – used for training baristas on hot, iced, and frozen drinks, Modbar training and friendly barista competitions. This space has three stations equipped with Nuova Simonelli Aurelia II espresso machines and doserless and manual coffee grinders. Cupping Lab – used for analyzing coffee samples, ensuring coffee quality, establishing roast profiles, cupping classes, scientific analysis of green and brewed coffees. This space is the central point for coffee and tea product innovations. Roasting Lab – used for teaching roasting courses, analysis of coffee roasts, roast profile analysis and roasting experimentation. This room is equipped with a 1 lb. U.S. Roaster Corp., a two-barrel Probat sample roaster and a Probat L12 known as Hansel. Cafe – a central gathering space. It’s equipped with a Modbar to serve up your favorite coffee or espresso beverage. The Family Room – known for the spacious kitchen and family style table, this room is perfect for meetings, culinary pairing events and gatherings to further connect through coffee and tea. Our cuppers have begun using the Innovation lab for coffee evaluation and new product development. Beginning in February, we’ll offer 7 Steps Training courses to our customers. In March, we’ll introduce several consumer training courses. From There. To Here. To You. This introductory course is all things coffee. In addition to training, the Innovation Lab is open for community and business meetings. To reserve a space, call 1.855.751.1292 or email marketing@crimsoncup.com.